Lift stations are commonly used as a part of operations across a variety of different industries. While they are extremely useful, they can be difficult to maintain when not cared for properly. At Microbial Discovery Group (MDG), we have spent countless hours in the field with our partners, reviewing their customer’s maintenance challenges, and looking for new ways to innovate. As a result, we were inspired to create a comprehensive approach to lift station treatment that can garner results quickly. By design, lift stations are used to pump liquid, typically some form of wastewater or sewage, from a lower elevation to a higher elevation. This process begins when sewage is fed into the station and into an underground well. The well is furnished with several different float switches to detect the volume of sewage present. 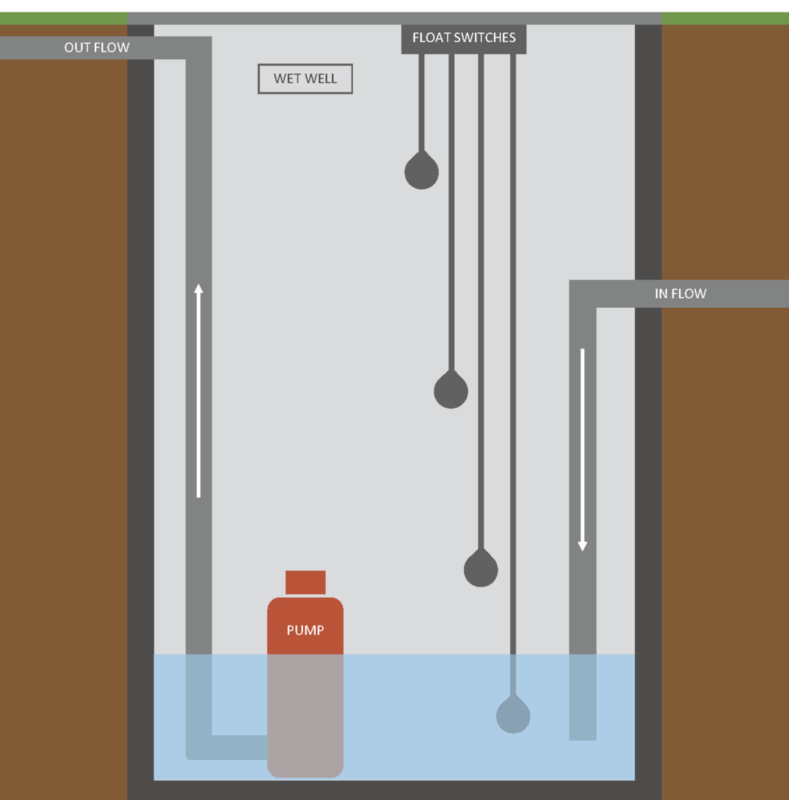 When the sewage level rises to a predetermined point, the pump begins to propel the sewage upward through a pipe system until it exits the station. From there, the sewage could be arriving to a wastewater treatment plant or to flow downward with gravity until it arrives at the next lift station. In some cases, the pump transports the sewage through a pressurized pipe system called a sewer force main if the sewage is needed to be transported over a long distance. In general, the appeal of lift stations is that they provide a more efficient way to move these liquids by employing the laws of gravity and can be installed to save facilities money on more intensive construction expenses. Transport waste and water from a lower elevation to a higher elevation. Utilize the flow of gravity rather than having to transfer the sewage through other means. FOG and Sludge Accumulation: The solid components of sewage, including sludge and fats, oils, and grease (FOG), that move through lift stations can accumulate during periods of low flow. This can cause major headaches for operators. For example, FOG is insoluble and often solidifies in piping systems, eventually amassing enough to cause a major blockage within the station. This accumulation often leads to decreased efficiency of the station and even equipment failure. If the pump is being faced with a high volume of solids over a long period of time, it can begin to wear out and require costly replacement. Pumping, Jetting, and Clean-Outs: The above-mentioned blockages can result in total failure of lift stations. The accumulation of solids is such a common, widespread issue that an entire industry was created dedicated to vacuuming them out. To ensure proper function of the lift station, blockages must be cleared and are often done so through pump outs, line jetting, and other labor-intensive means. All of these options come at a high cost. Hydrogen Sulfide: The FOG and sludge accumulation create an anaerobic environment where H2S, the culprit of the unpleasant rotten eggs smell, is being produced. If not taken care of, operators can receive community complaints and may even face unwanted lawsuits. Unpleasant smells aside, H2S is considered a poisonous gas and can be harmful and even deadly for operators. This harmful compound is also responsible for corroding mechanical and electrical equipment, requiring costly replacement. It is unreasonable for a lift station to function properly when it’s literally falling apart at the seams. Odor Control: In addition to H2S, other biological acids are often released as a result of a poorly maintained lift station. When the levels of these compounds get high enough, these foul odors can be so strong that operators often receive community complaints from the surrounding area. The most common way to combat these odors has been to pump costly, caustic chemicals into the lift station. In addition to being hard on the budget, these chemicals often only mask the odor and cause further upsets downstream. After spending extensive time in the field, we saw how traditional maintenance methods for treating the above required a significant investment. When developing our wastewater offerings, we wanted to challenge the norm. What if there was a more complete, less expensive way to treat lift stations? Our goal is simple: keep lift stations up and running by treating with a cost-saving solution for both our partners and their customers. With our Biotifx® products, the most common long-term lift station challenges can be resolved. Coupled with our hands-on partnership approach, we are proud to offer our customers a high success rate. When maintained properly, lift stations are a great addition to a wastewater treatment operation. We want to allow people to work smarter, not harder by treating with bioaugmentation. The reward for treating with Biotifx® is that it demonstrates success quickly. CONTACT US to see how we can partner with you and keep your customer’s lift stations safe, clean and up and running!